In the past year the word "emergency" has so frequently been used to describe the migration phenomenon that the two words are seldom used apart. This is because it is indeed, an emergency. 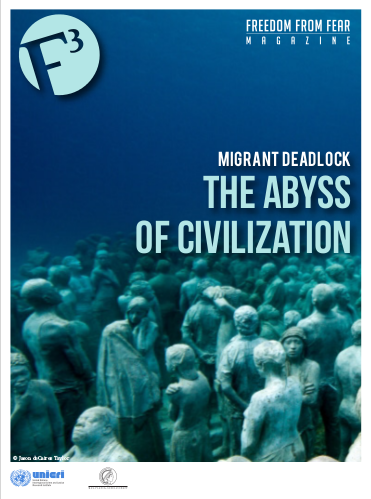 Although migration has occurred throughout history, we seem unprepared to protect the victims. In only one of the many examples, from 1970 to 2010, 1,417 million legal migrants from Africa and 4,287 million from Europe moved to the United States. This does not include the illegal migration. 1. Introduction The ‘refugee crisis’ in Europe touches on fundamental issues of international law, criminal policy, criminology – and victimology. Public perception of and opinions on human trafficking, human smuggling and the situation of migrants in general is in a state of flux; perceptions and opinions are heavily influenced by media depictions and highly dependent on the general political climate of a society. The Mediterranean has historically been a space of exchange, contact, and conquest. Migration – in all directions – has always been part of the cultural, political and economic negotiation around “Mare Nostrum.” Few things, however, have thrown European identities and the European political project into question more than the recent movement of migrants and refugees across the Mediterranean. As Europe struggles to find a coherent approach to its burgeoning refugee and migrant crisis, one set of actors has been universally vilified: the migrant smugglers. While they are not the cause of the current crisis, they have certainly amplified it, and are often responsible for the greatest violations against human rights and protection. Turning attention and public outcry toward the smugglers arguably allows the EU member states to detract – and distract – from their own derogations of their obligations to international law and refugee protection. From politically charged headlines to hate-filled interactions on social media, the phenomenon of words being used as weapons has rapidly taken shape in the public sphere within the last decade. Advances in global communication have made it easier for people across the world to stay in touch, exchange ideas, and foster cooperation at all levels of society. Nevertheless, communication technologies can also be used to spread extremist ideologies, racism, xenophobia, and other social ills, while potentially inciting individuals or groups to commit psychological abuse or physical acts of violence in the real world. If I awake to look out my window, walk out my front door and to my right, left and for as far as my eyes can see, my once tranquil city is plagued with carnage, bloodshed, strife and civil war would I not seek a safer life just over the mountains or across the sea? The idea of migration being a human right is far too often overlooked in the domains of international security organizations, as domestic governments and global policy makers attempt to fortify parts of the world to populations they have deemed undesirable. It was the beginning of October, we left Turin (Italy) at dawn and after a long stopover in Paris, we landed in Erevan, Armenia’s capital city, late at night. Father Mario, a Camillian, was waiting for us there. He has been living in Armenia for many years and is the administrative manager of a hospital, located in the Ashotsk region, where he oversees the distribution of basic necessities to a population becoming poorer and poorer, daily.